Yay for nice weather finally! Clear roads, no snow.....means it is road trip time! ​I love going on road trips, but have learned that with kids it is a little more than hop in the car and go. You've got to have snacks, prepare for any possibility and keep them entertained! We can't promise there won't be anyone saying "Are we there yet?" 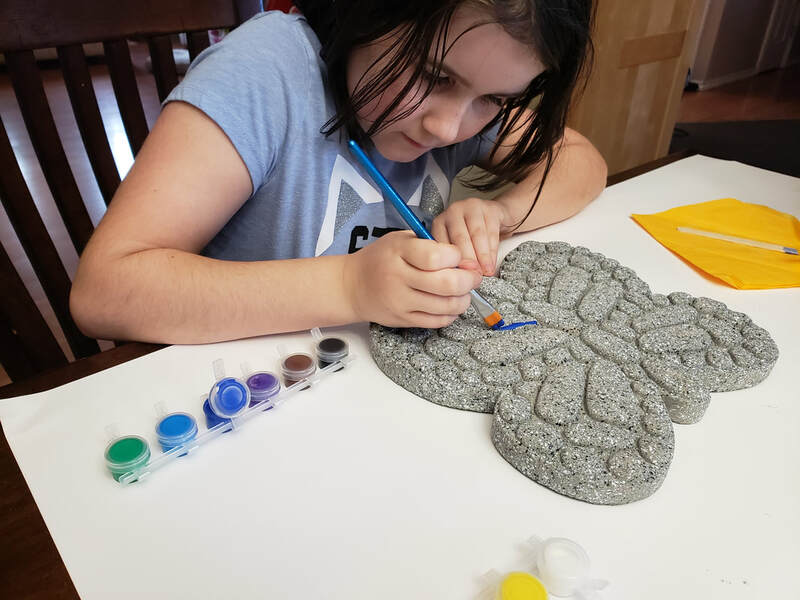 On a recent trip that my family took this past spring break, we took along the Magnetic Super Mind. What a fantastic discovery for keeping busy and perfecting skills at the same time! Super Mind and Mighty Mind both come with plastic shaped tiles, and puzzle cards to build on, or just let their imagination fly and create their own shapes and mosaic masterpieces. 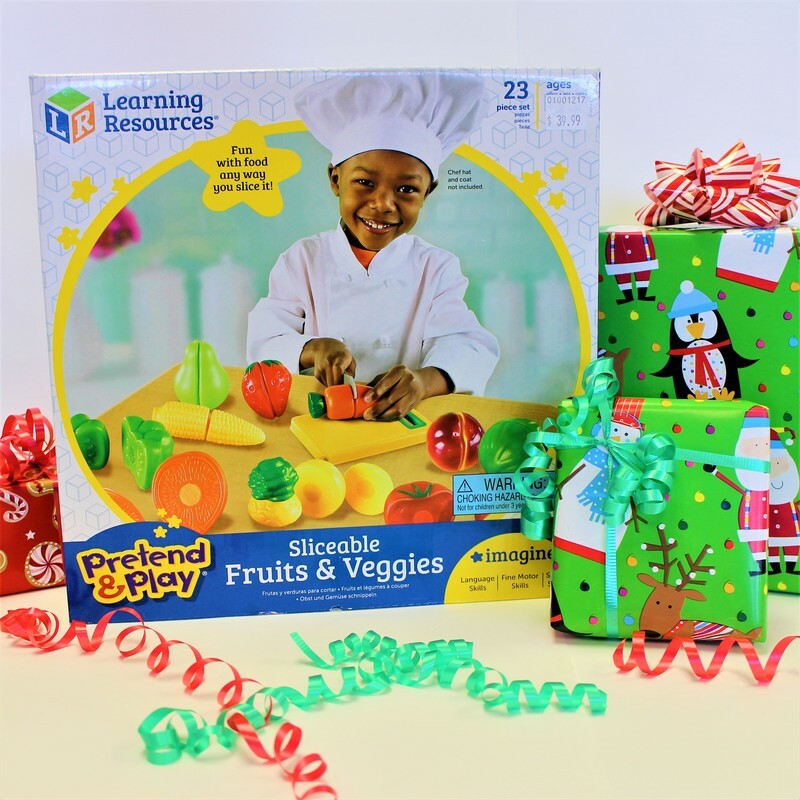 Both versions help kids develop creativity and visual/spatial relationships. 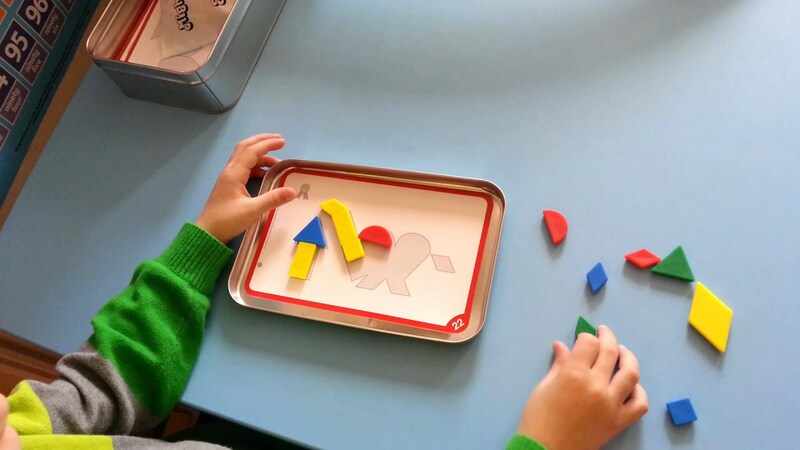 You could also work on colours, shapes and counting with the tiles. Extra puzzle cards are available as well. My 6.5 year old, and almost 10 year old both loved the puzzles and were challenged by them. We also had a pretty creative tree made, and some mosaic patterns. As a bonus, once we reached our destination, my (in their 30's sisters) sat down and completed all 32 puzzles and were disappointed that I didn't have more cards! Even at home, our Super Mind continues to be played with - that is a win for me! that contains so many possibilities! 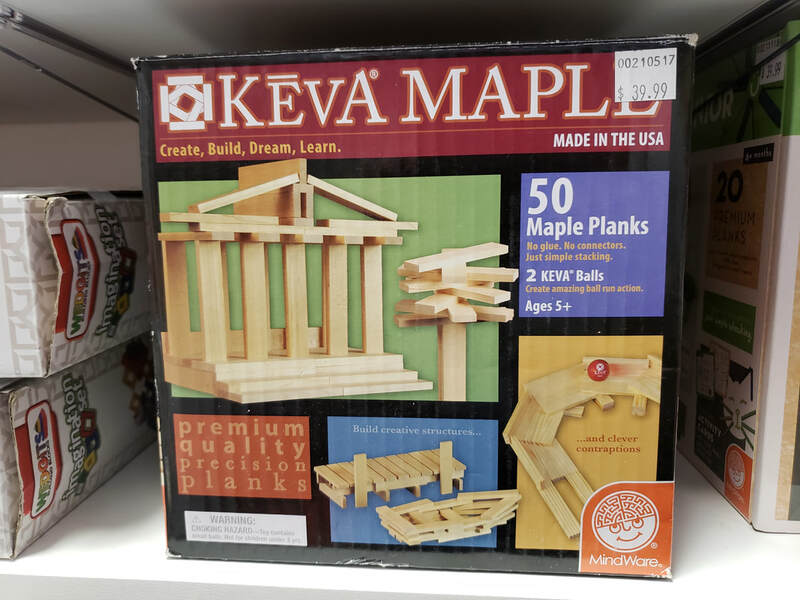 Keva Planks are hands down one of my favourite building toys - their simplicity sparks imagination and a challenge! 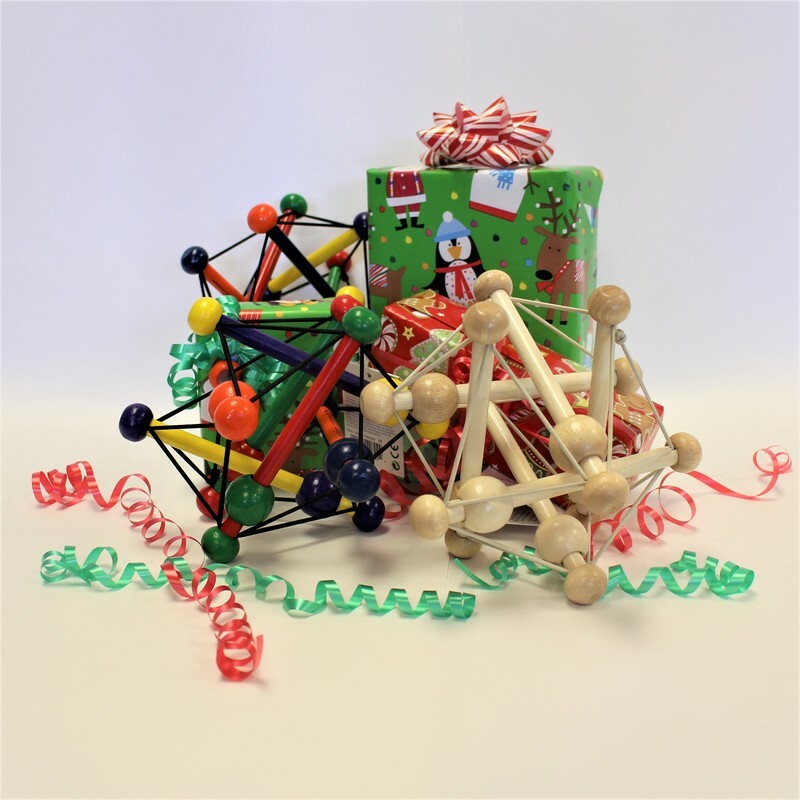 They are fun to play with AND teach our kids (and adults!) mathematics and science. They are also perfect for any age or ability level. How tall can you build before your creation falls over? What could you do better next time? Could you build a _______? 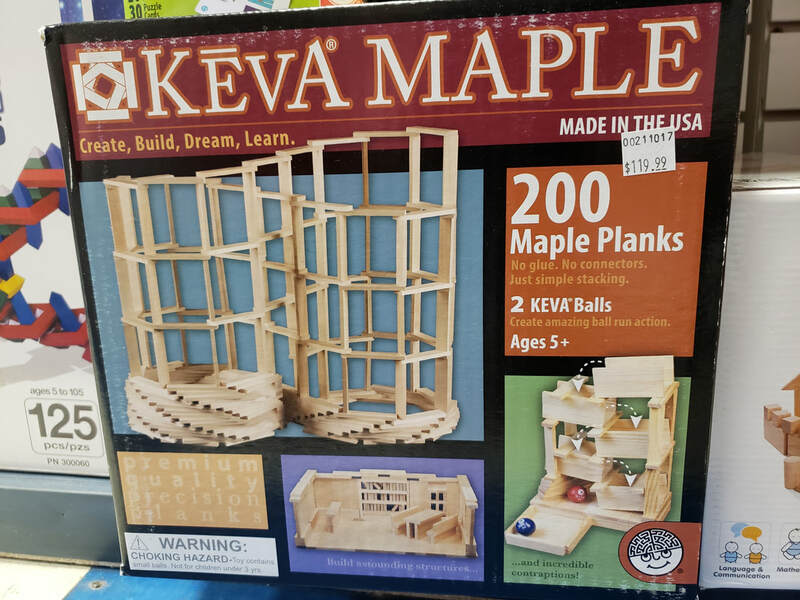 ​The simple shape makes it easy for kids to unleash their imaginations, but if you need a starting point each box comes with a guide full of ideas and challenges - plus check out the Keva Planks website, under the educators tab there is a wealth of information and projects including pictures for every age and ability!! 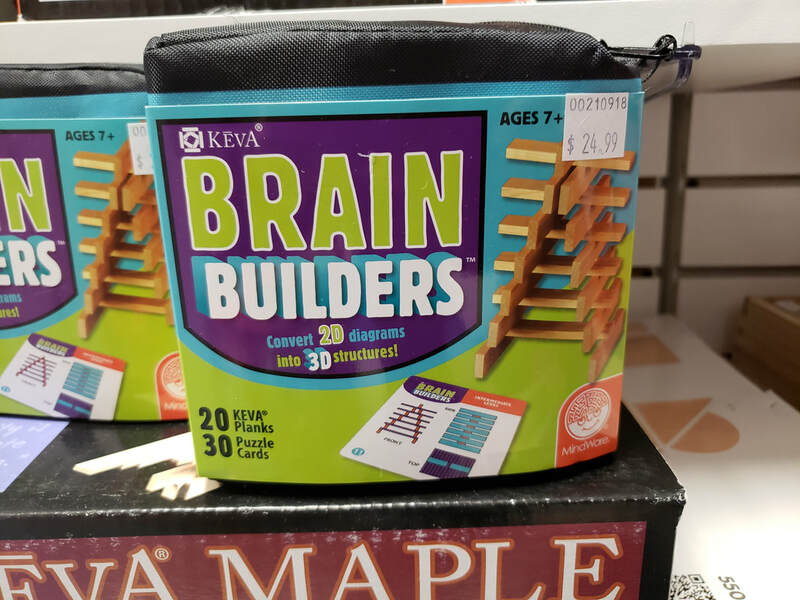 I really like the Brain Builders sets (available in Junior and 3D Challenges) because they are PORTABLE! Perfect for killing time at a restaurant, doctor's office and small enough to fit in your purse or diaper bag. Each set comes with 20 planks, cards with various challenges, & a little bag to store them in! 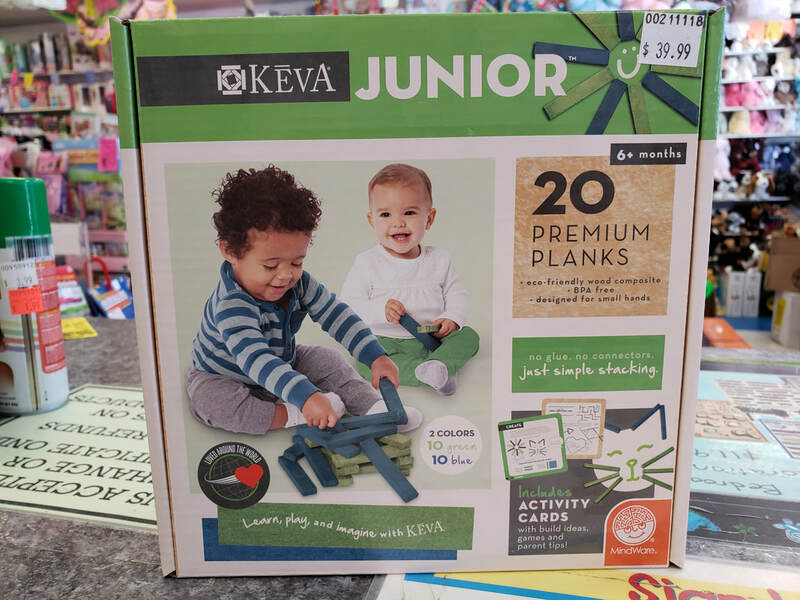 What fun have you had with Keva Planks? Share your pictures on our Facebook Page! Are you intrigued? Shadows in the Forest is a family game with 2 to 7 players! As a family of five with a wide range in ages, it can be hard to find a game that we can all play and enjoy. This game hit all those points, and you can customize the difficulty of play. One person is in control of the lantern, aka the seeker and everyone else is in charge of the Shadowlings and needs to work together to keep them safe and ultimately get them all to one hiding spot to win the game! We suggest using at least one more Shadowling than there are players and using less hiding places for longer game play - overall we give the game a 5 out of 5 for fun, ease and laughs! Turn off the lights and go play!!! 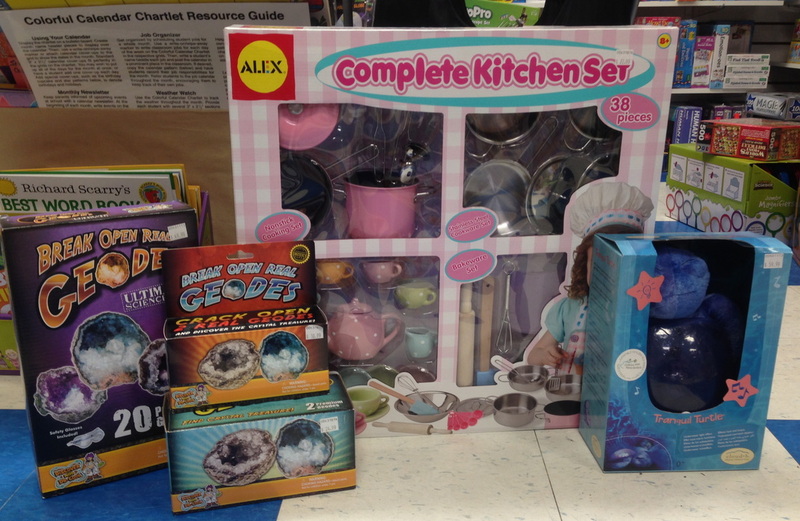 Here are a few of Nancy's favourite things to get you started!! ​ Brictek People - They are compatible with the leading brand and come in a variety of themes. 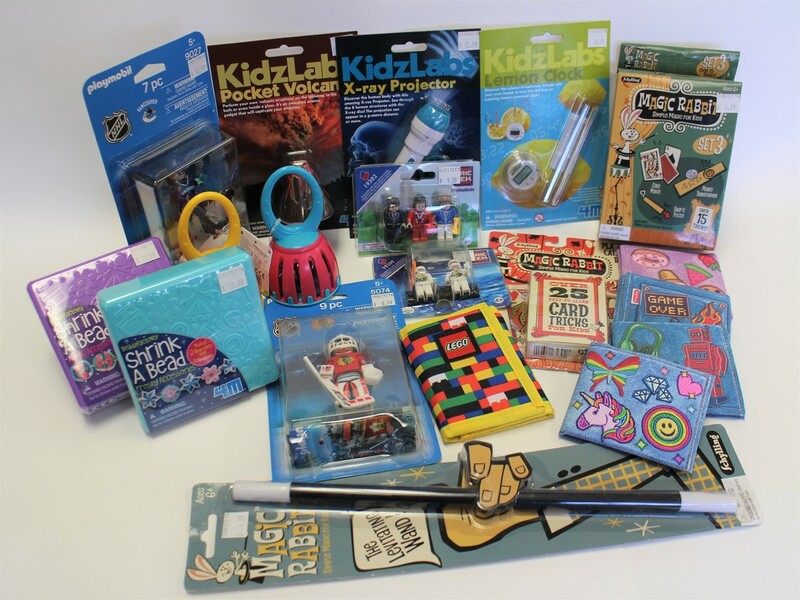 Kidz Labs - Small Science Kits in a variety of exciting types. Magic Rabbit Card Tricks - perfect for adults and kids! Cage Bells - safe and so much for the younger ones! Fun wallets for all that Christmas money!! 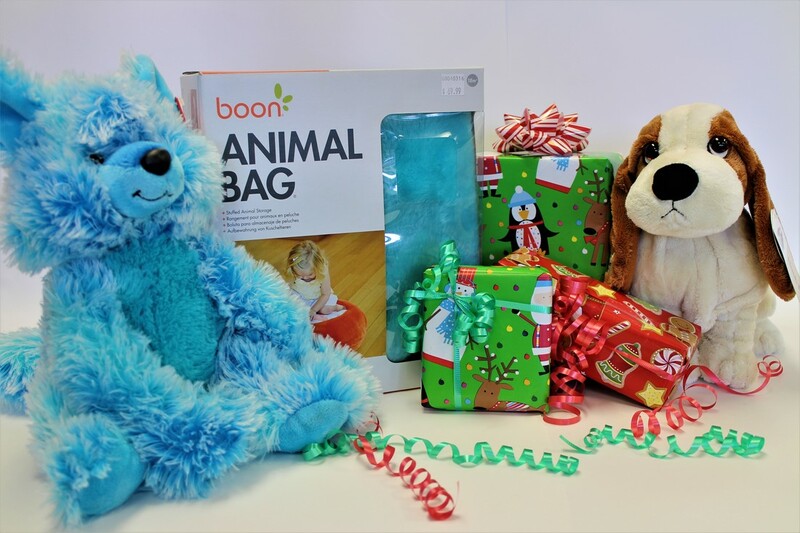 Boon's Animal bag helps contain the extra thousands of stuffed animals roaming your house! It turns them into a comfy place to hang out, read a book and cuddle with a stuffy :) If you need a stuffed animal we can help with that too! 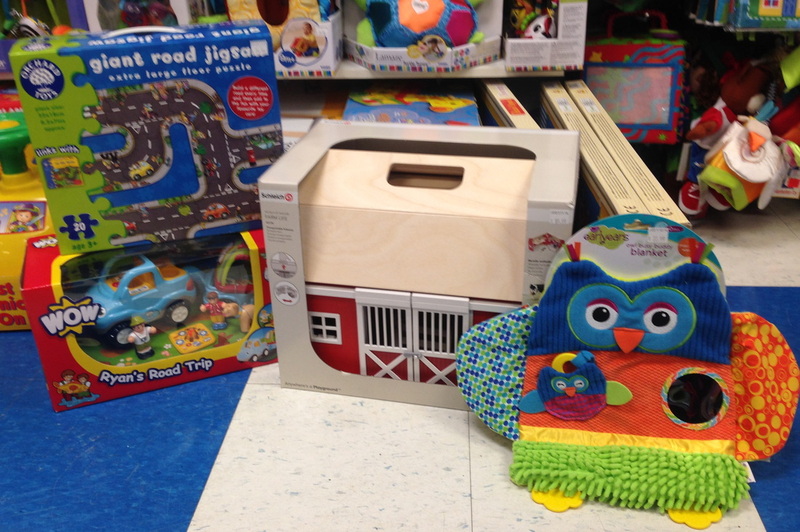 Skwish is an award winning, classic wooden toy that is awesome for motor skill development and perfect for teething! Keep one in your diaper bag and one at home. 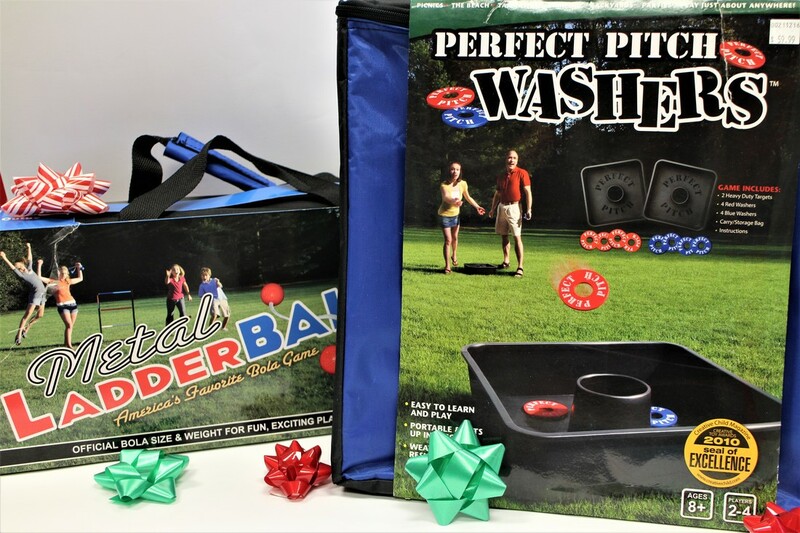 Ladderball and Perfect Pitch Washers are great games for the whole family! Both come with convenient carry bags so you can take the fun with you to the beach, camping and your backyard. Winston Churchill once said "We make a living by what we get but we make a life by what we give"
and what better time to give than the holiday season? 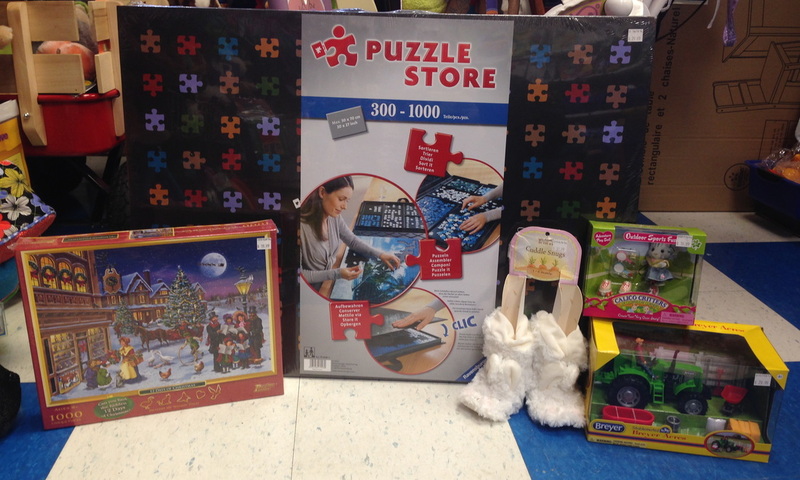 The first opportunity is the Angel Tree at the store! 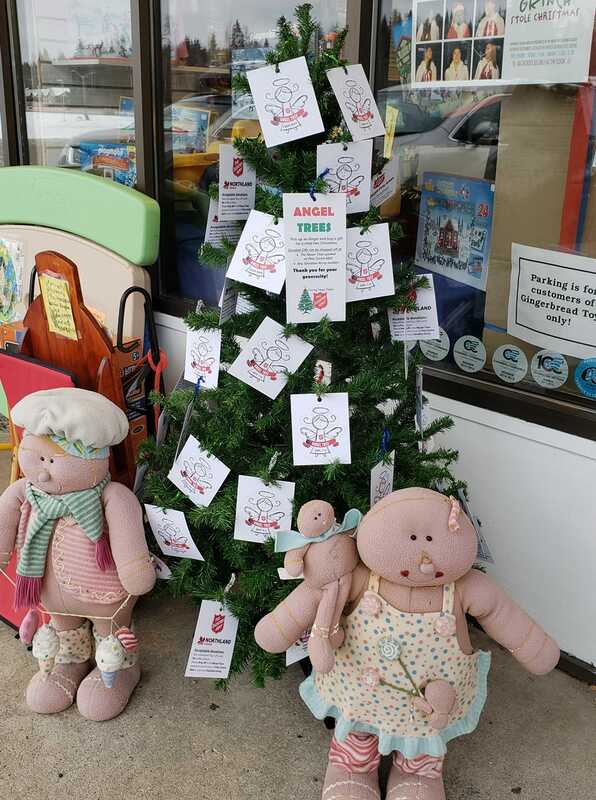 Pick a tag off the tree and buy a gift, its that simple :) There is a variety of age groups on the tree and we can help you find a gift that fits your budget. 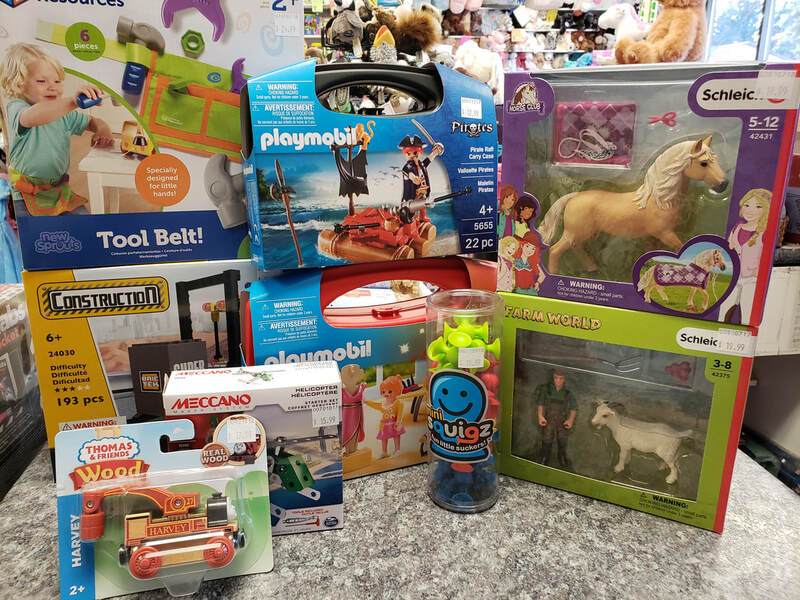 Every little bit helps make Christmas happier for a Prince George child. Last but certainly not least, the UHNBC Paediatric Ward is another awesome place to give this holiday season! 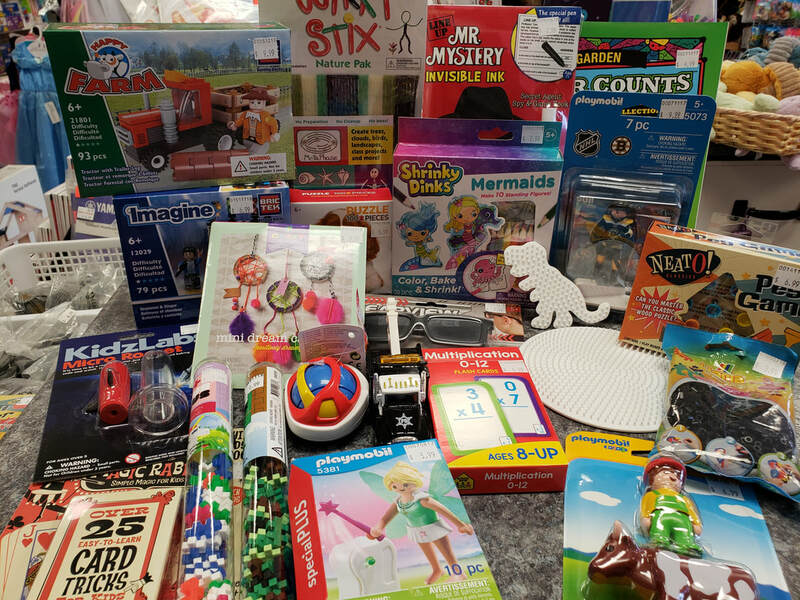 Unfortunately, many kids have to spend the holidays in the hospital and you could put a smile on their faces by giving them the gift of play! 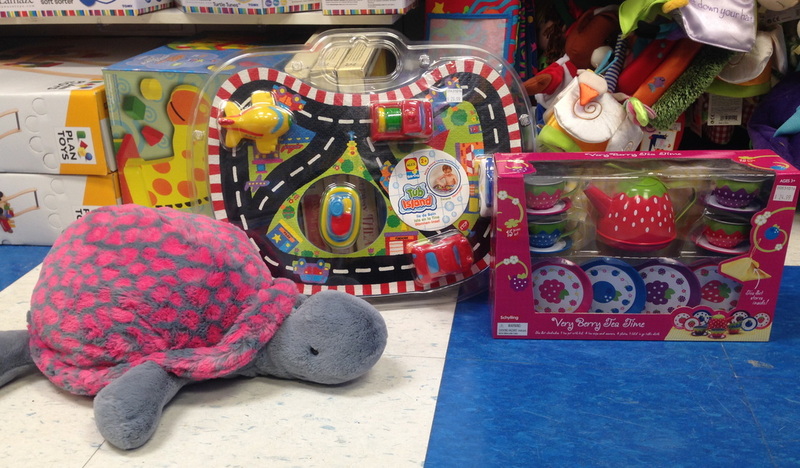 We would like to offer a discount to anyone buying toys for these opportunities. ​Just mention the reason for your visit to receive the discount! My kids and I recently got to try out a new product that is in the store. 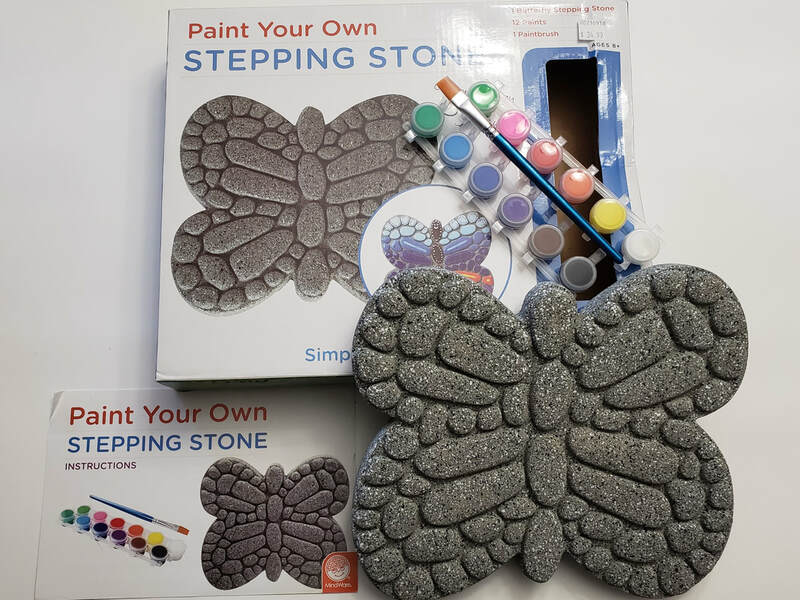 Paint Your Own is a line of products that features stepping stones in various shapes, and 3-D items like bunnies and flower pots. Each kit comes with all the supplies needed to paint the project, all you need to provide is an oven and a cookie sheet to cure the paint. 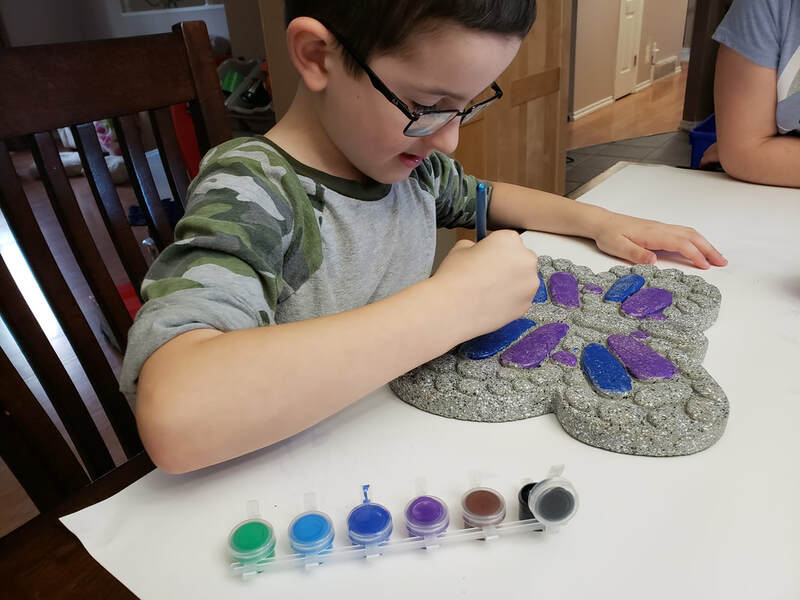 Mom's Review: This is a super easy project and one that could be shared as well. My kids took turns painting and worked cooperatively (rare but it happens!) on deciding colours and patterns. As far as the kit goes, I was pleased that everything needed was in the box. There was also a lot of paint, and the paintbrush was of decent quality. A word of warning, the instructions say that the paint may stain clothing and in our experience it does, so break out the painting smocks or shirts and cover your surface well. 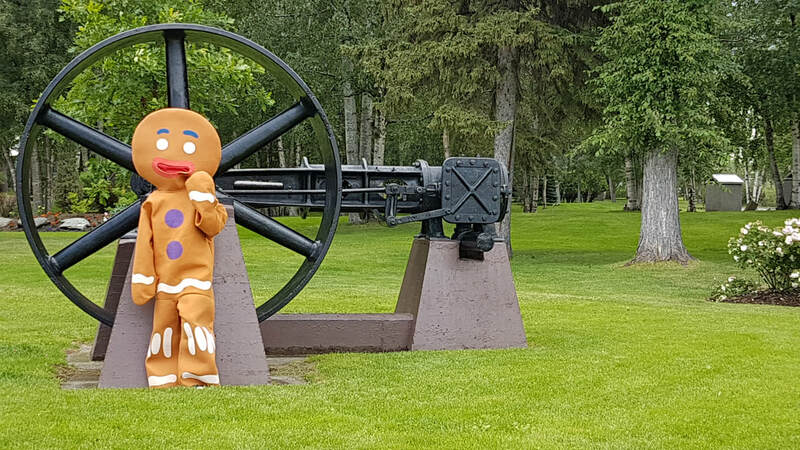 The baking process was simple, and I can't wait to put this in our garden next year! This was a fun project, I want to do another one on my own next time! It does take a while to do because you have to let the paint dry and most of the colours need a second coat of paint. I also liked that we had lots of paint leftover and were able to paint rocks to leave on the trails for people to find. 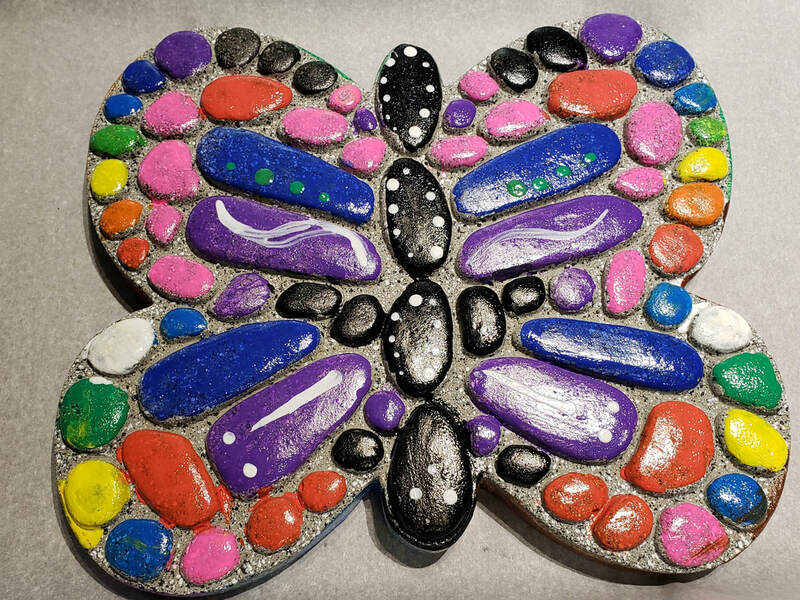 I liked painting the butterfly, but didn't like that I had to do it twice. My mom helped me with the second coat. It was a good art project and I liked being able to paint more rocks after. Do you have a product that you've purchased from us that you would like to review? 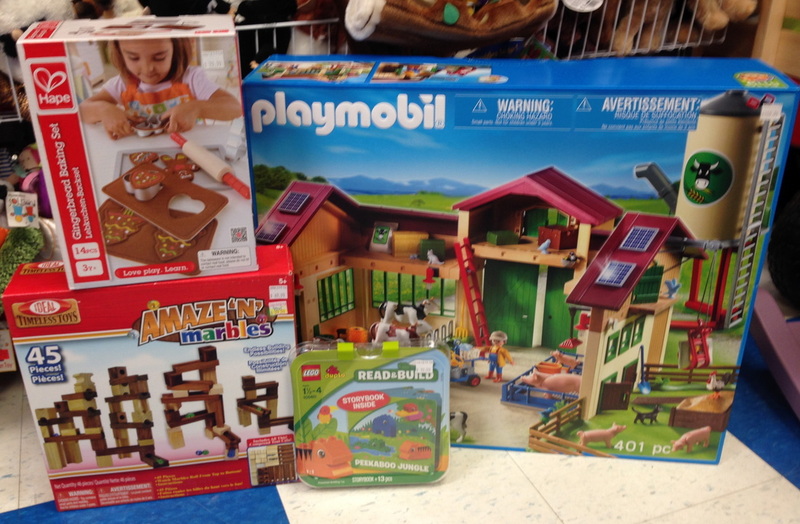 I started in the toy business with Gingerbread Playhouse in Skeena Mall in Terrace back in 1989! Almost 30 years...it has flown by. Back then, and still today, it was important to me to have good quality toys available, ones that wouldn't end up at the bottom of the toybox or in the landfill! So much toy advertising is done where the toy is tied to TV shows/movies or corporate interests, and more money is invested in the advertising than in the quality of the toy. And it is my privilege today to work with others who believe in the same philosophy of "good" toys. I have 2 sons, and was recently made a grandmother by the older one, Jim, when James V was born. Jim works in IT at Northern Health (the guy with the math and computer brain from day one). My daughter-in-law, Emma, is currently on mat leave from Exploration Place, where she has worked many years. Tennis is our family sport, we all play, and my younger son, Kristian, is currently playing on the UBC team and working on his doctorate in Chemistry, after 4 years at Doane College in Nebraska. He has also "imported" a wonderful girlfriend in Cheyanna. We are also big hockey fans, enjoying the NHL, and support the Prince George Spruce Kings. so many rabbits and rodents in our selection of stuffed animals in the store! They are a great toy for boys and girls, for a wide age range and the building of the track grows young brains. Then the fun of "driving" the trains around begins! Every time you add a new piece or train, it's a whole new toy. And all practically indestructible, pass it on to the grandchildren and their children! After a long break, the Gumdrop Button Blog is back! This time of year, we're thinking about holidays--and travelling. And those long road trips! "Are We There Yet??"!! (which is one of the best travel games we've found, ask us for the handout with the variations on the basic game). Fun for adults too, but drivers, sorry, you'll have to keep your eyes on the road! 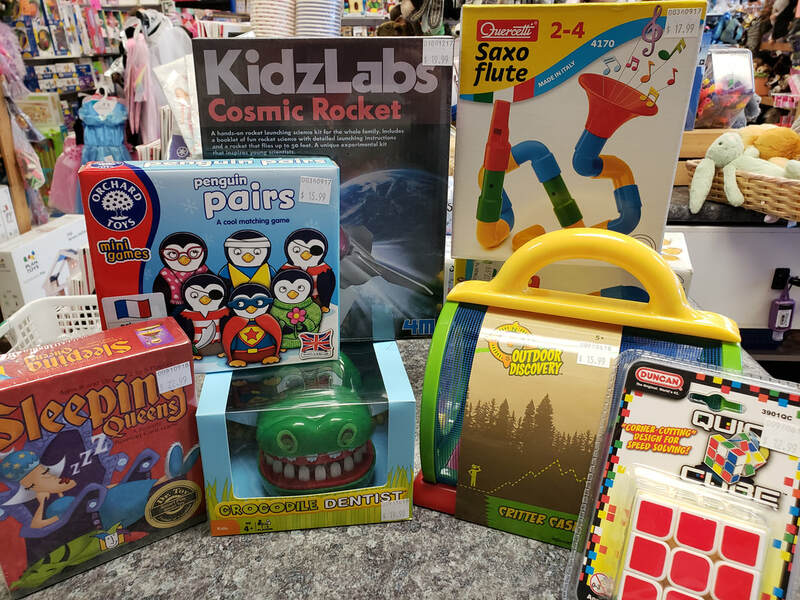 Of course, we have many toys in the store which help to pass the hours in the car, on the plane, and even ideas for burning off energy at rest stops or for rainy days at the cabin. 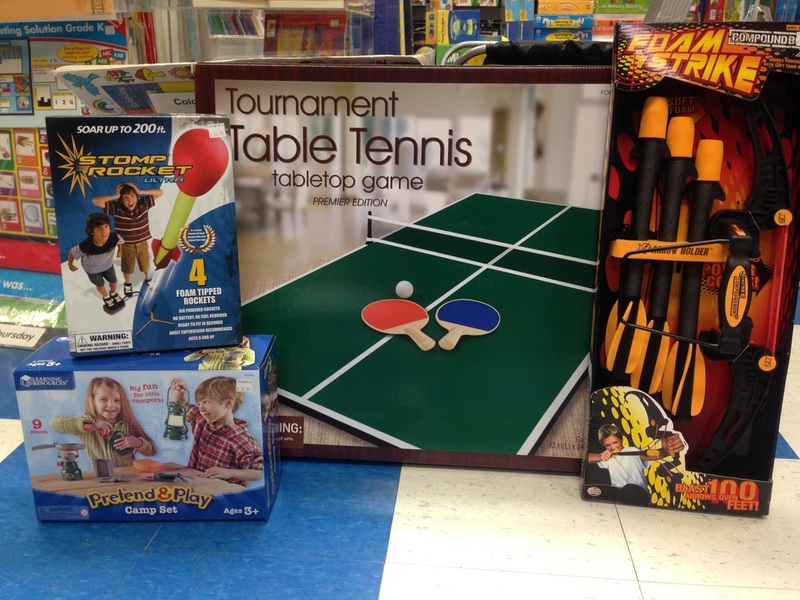 And, see below for our list of fun games, tried, tested, and approved, FREE!, and no extra equipment required! If you need anything for travel, stop by the store and our helpful staff will have plenty of suggestions. We also have a list of ideas you can take home, sometimes you can re-purpose what you already have. Endings: Pick a theme (e.g., animals). One person says a word in the category and the next person says another word beginning with the last letter of the previous word. For example, monkey-yak. Alphabet Game: Can you think of a city, name, fruit, or colour that starts with each letter of the alphabet? The "other" Alphabet Game: Find the letters A-Z in order on the signs or license plates. Anything goes as long as it's outside the vehicle. The first person to spot a letter gets to use it. Change it up by doing number 0-9 after the letters. Or finding A-Z, 0-9, and then 9-0, Z-A. For a more advanced version if you're in an urban area, only letters starting a word can be used. 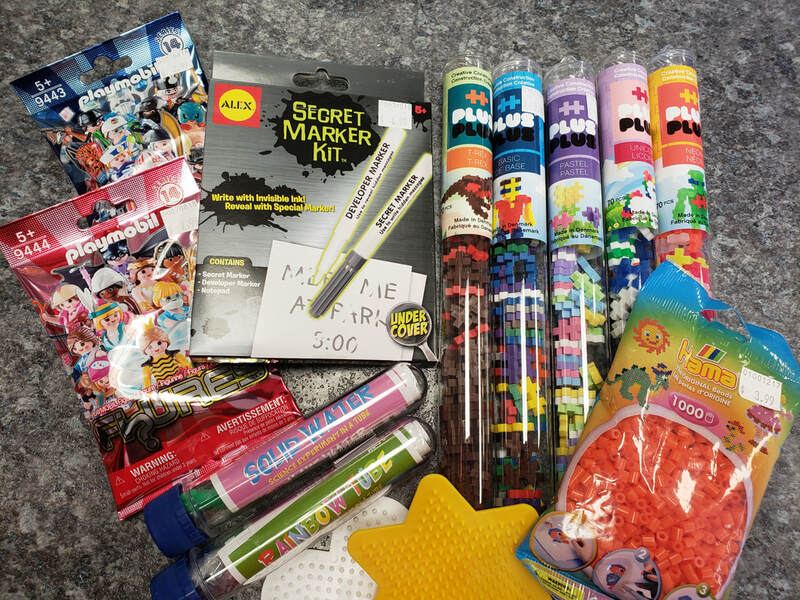 Travel Bingo: An adult can make up bingo "cards" with different pictures, words, numbers or letters for the kids to find as they drive. There's lots of free printable cards like these online too if you don't want to make your own! Stories: One person starts a story and the next person adds a sentence. Use a story in a book and ask for nouns, verbs, etc... to replace the ones in the book. Name that Tune: One person hums or sings a song. The person who guesses the tune hums next. Jim Dandies: Pick a word and see how many rhyming words or sentences you can say. License Plate Scrabble: Be the first to make a word out of the letters on a license plate. Add any letters you want but keep the letters on the license plate in the same order. For example, WLK=walk, FLD=flood.